This frame recently emerged onto the market, and was fortunately captured by a connoisseur who wanted to explore its probable provenance. This article stems from the subsequent investigation. It is a frame remarkable for the intensely sculptural and plastic quality of its design, and the vigour and animation of the carving. The relative simplicity of the underlying structure (two branches holding the inner frame), coupled with the complexity of the intertwined and radically undercut leaves on those branches, indicate that the master carver who made it, and – if he did not also design it – the architect or ornemaniste who produced the drawings for it, were both important and adept within the development of Baroque sculpture. It is also notable for the emblem at the top; the faceted eight-pointed star on the leafy top-knot of the central mascaron. This may perhaps be the emblem and part of the impresa of the Chigi family, which together consisted of a pyramid of six hills with a star above and the motto, ‘shining at the summit’ (micat in vertice). 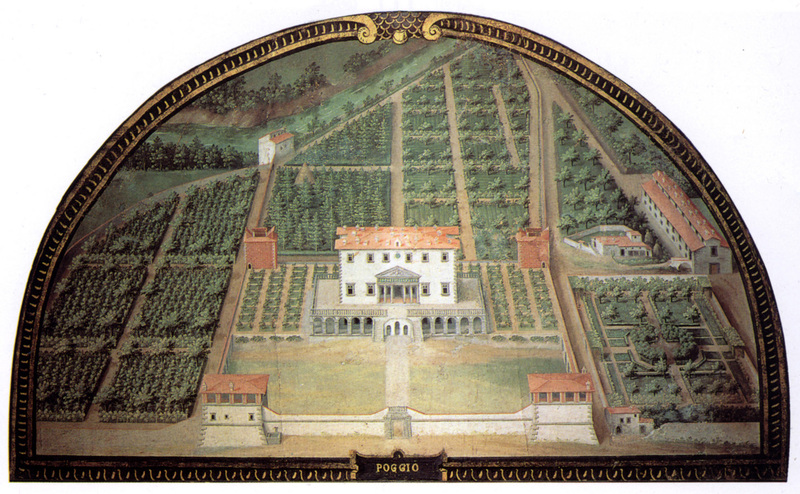 Wreaths of oak leaves were added in support of hills and star when Pope Julius II allowed his banker, Agostino Chigi, to use the oak trees of his own family, the Della Rovere. 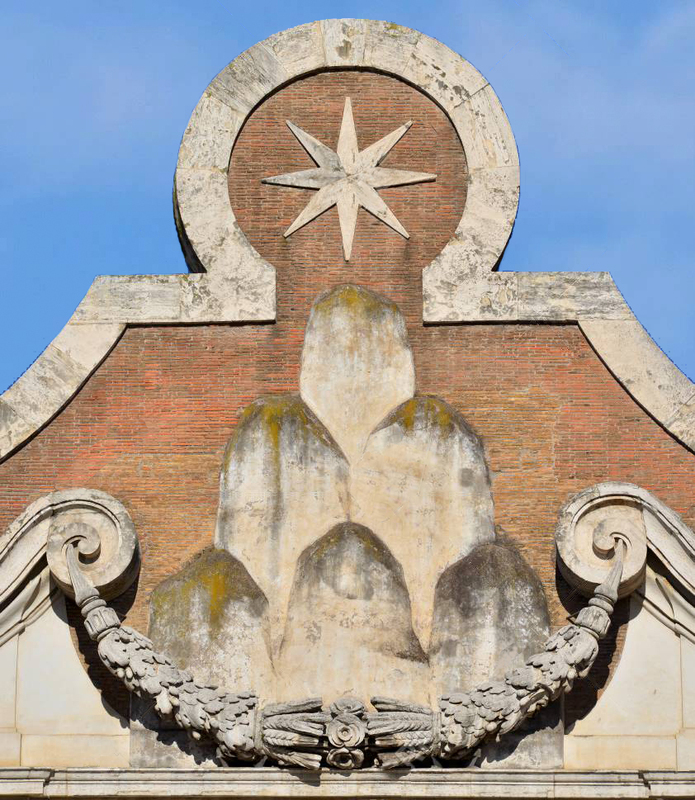 However, the star might also be the device of the Altieri family, which is an upturned pyramid of six stars with the motto, ‘as high as is possible’ (tanto alto quanto se puote). 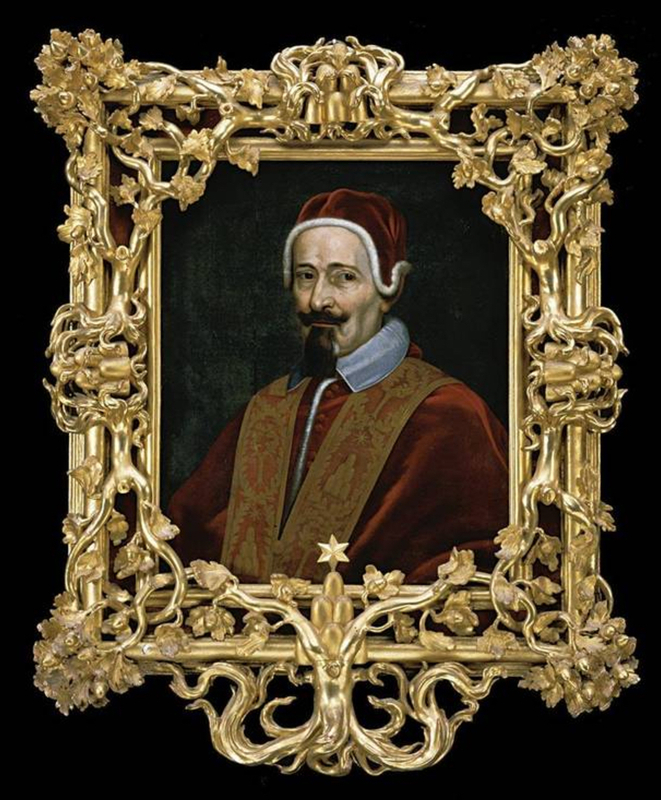 The Altieri intermarried with the Chigi; there was a Chigi pope, Alexander VII (1655-67), and an Altieri pope, Clement X (1670-76), during the period when this frame was most probably executed. 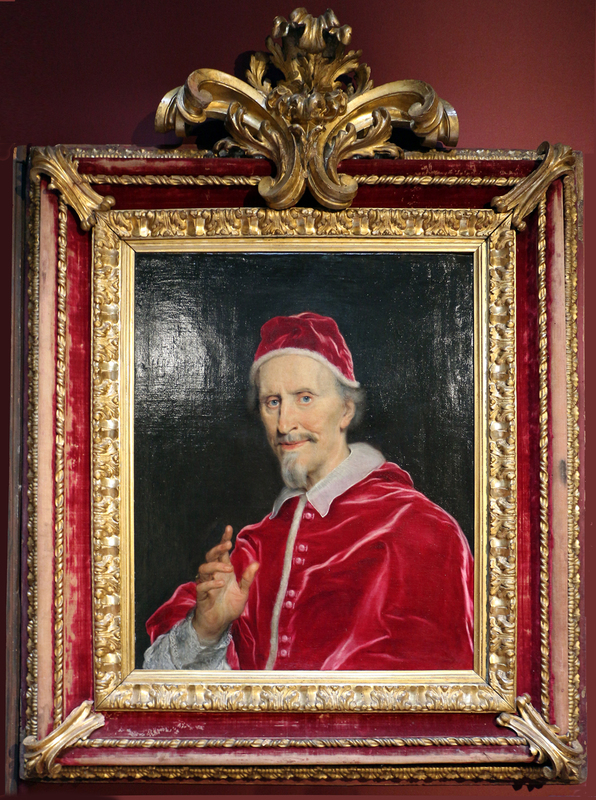 The quality of the frame, evidently the work of a master, along with an heraldic link to two powerful and inter-related papal families, indicates that its provenance is from a Roman collection; it may also indicate a possible stylistic connection to Bernini. Bernini was employed by both Alexander VII and Clement X, and the Palazzo Chigi Ariccia, for example, which still contains its original Baroque furnishings, as well as other items from Roman palaces in the Chigi-Altieri circle, is particularly relevant in relation to this frame. 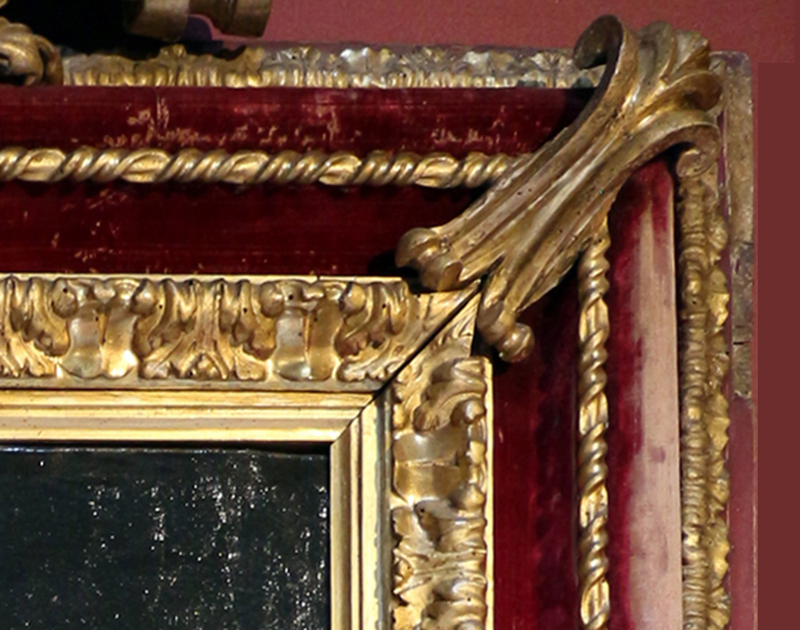 The carving is finely executed, and is an exceptionally rich variation on the ‘Salvator Rosa’ gallery frame, opulently enriched with velvet to match the papal robes in the suite of portraits. Like Gaulli, who was an artist in Bernini’s train, and was given his great opportunity through the latter’s support (decorating the vault of Il Gesù, including the nave and dome, at the age of 22), Antonio Chicari worked in the orbit of Bernini, carving frames, furniture, and (apparently) carriages to his design or to those of his followers. 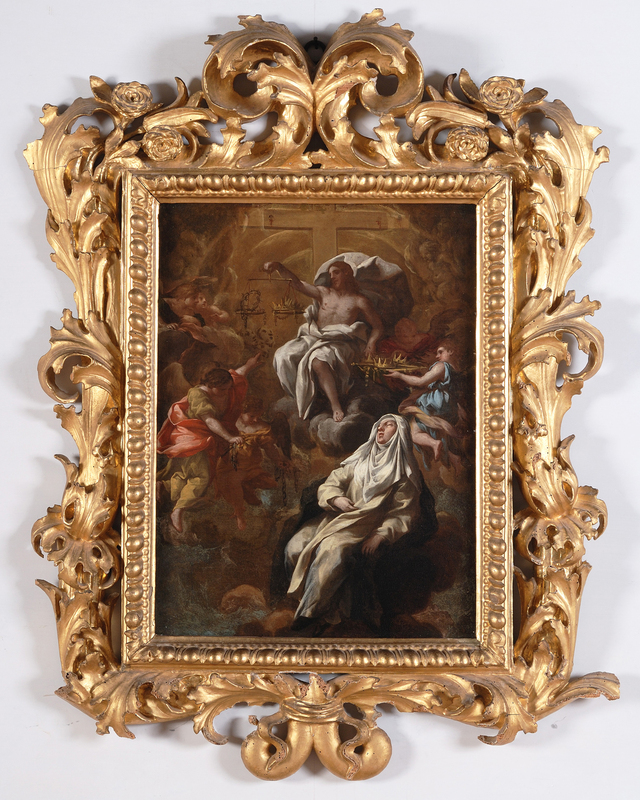 This frame in the Liechtenstein Collection is also credited to Chicari, and described as ‘probably made to a design by the sculptor Gian Lorenzo Bernini’ . This reference to Bernini is based on the cherubs’s heads, which are carved completely in the round, individualized and full of movement. The main body of the frame consists of a wide flat frieze, which would be the reverse of Baroque in its lack of differentiated profile, save for the three-dimensional quality of the carved ornament. This is clearly a major trophy frame. An undulating vine grows from the censer swung from the base to the wreath at the top; it includes roses, small sunflowers, violets and daisies, attributes of the Virgin and of Christ, and oak leaves, either for the Della Rovere or the Chigi. 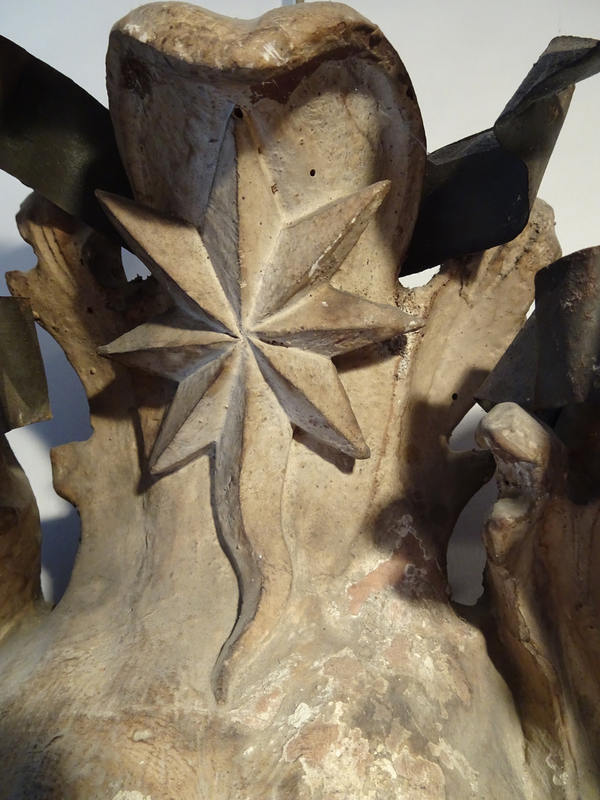 The wreath at the crest contains more flowers and oak leaves, and holds three stars sandwiched together. 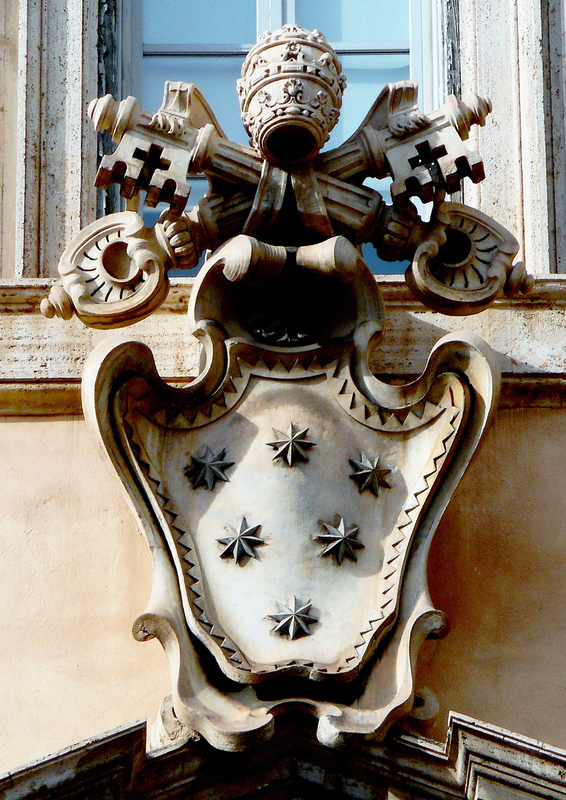 This particular emblem might be a conflation of a Chigi star, an Altieri star, and the Star of Ocean for the Virgin, or any single one or combination of these. In the centre of each side is a large closed clam shell, which may either be an elaboration of the pilgrim’s scallop shell, or, more likely, the representation of a stoup for holy water. The censer, standing for the incense of prayers rising to heaven, may, through the references to the Virgin, also symbolize her intercession for Man to God; perhaps combined with the shells this may also be a reference to baptism. 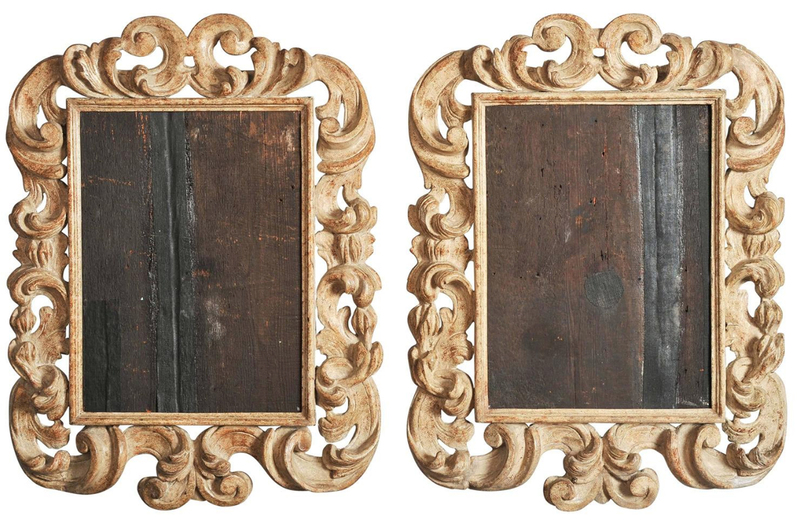 This frame was presumably carved for the painting of a Madonna and Child; its difference from the suite of frames on the papal portraits in the Palazzo Chigi is a measurement of Chicari’s range of idiom, and technical skill. ‘A spectacular Berniniesque frame, enveloped – as though by some carnivorous plant – with oak leaves and branches, to the point of suffocation, [which] contained a portrait of Alexander VII by Giovanni Maria Morandi (Ariccia, Palazzo Chigi). This is identifiable with “a carved and gilded frame for a portrait of NS”, for which the artist was given the remarkable sum of 45 scudi on 28th August 1658.’ . This is unmistakably a Chigi trophy frame, all the ornament deriving from the family impresa, and applied to an otherwise starkly simple moulding frame. 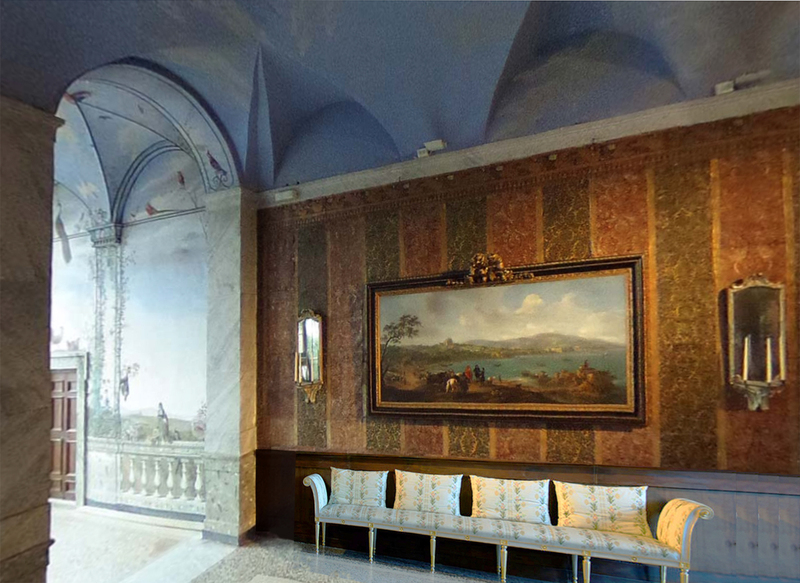 Two further items in the Palazzo Chigi, also produced by Chicari, are especially important in connection with the work under consideration, although these are not themselves frames. They are two console tables, designed by Bernini and executed by Chicari. 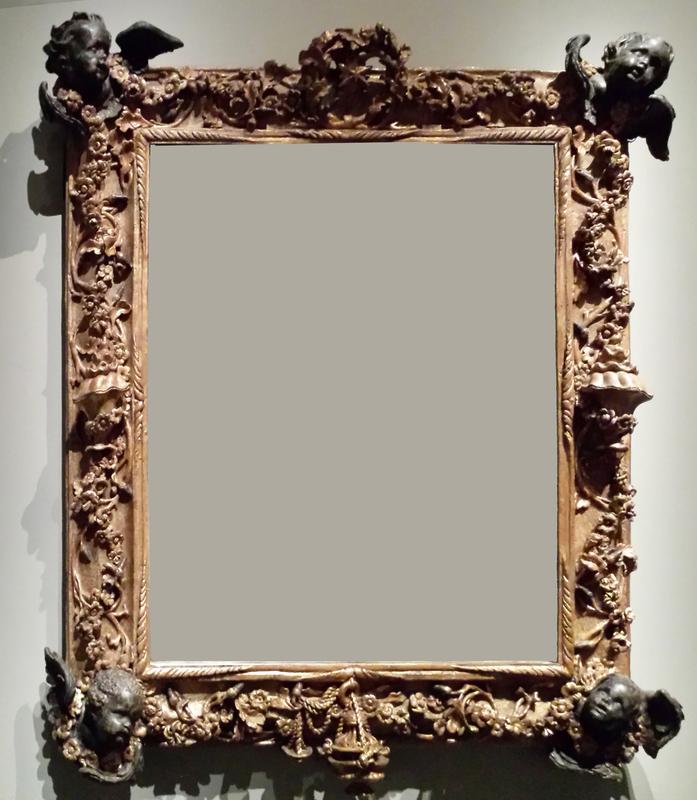 Like the frame with mascarons, the structure is at once extremely simple, and offset by a virtuoso elaboration of complex ornament; in this it is expressive of the height of the Baroque, creating a tension between a fairly minimal organic form and an operatic profusion of decorative detail, between stasis and movement, and between light and shade. Four large S-shaped cornucopiae balance the table top, whilst smaller versions entwine them at the base. All are wrapped in large acanthus leaves; the large cornucopiae spill roses, lilies and branches of oak leaves, and the smaller ones a bouquet of mixed flowers, including narcissi. 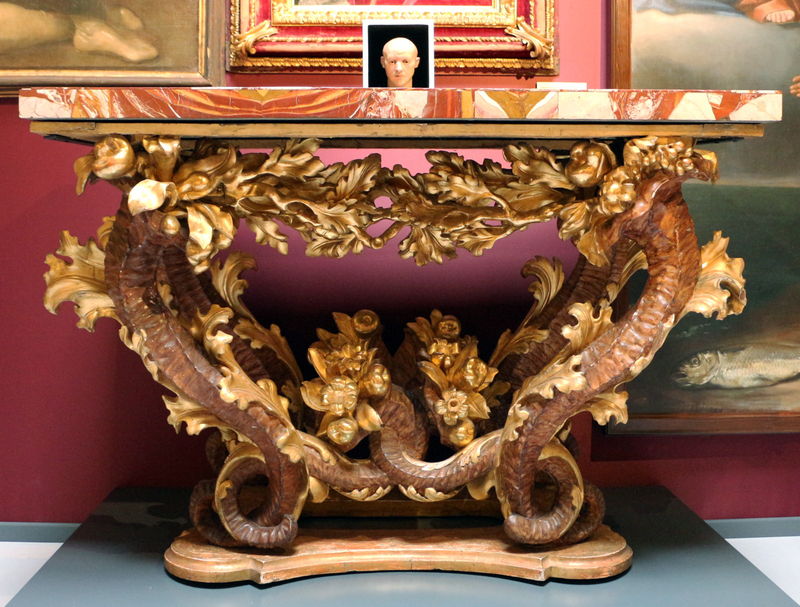 The style of the acanthus leaves and flowers on the console tables and frame are very similar, in the curving forms, serrated contours and heavy veining of the leaves, and in the structure and treatment of the flowers (taking into account that the tables have been gessoed and successively gilded). 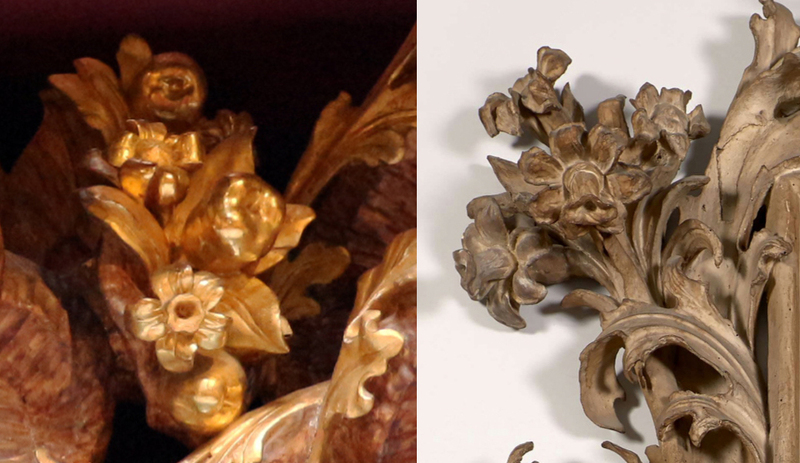 Professor Petrucci notes that the mascaron frame under discussion is ‘a typical expression of Roman Baroque decorative art, with a naturalistic, Berninian origin’. He has described it as ‘very similar to the Chigi frames’, but has added that it is also like ‘other Baroque frames of the late 1660s and 1670s’ . 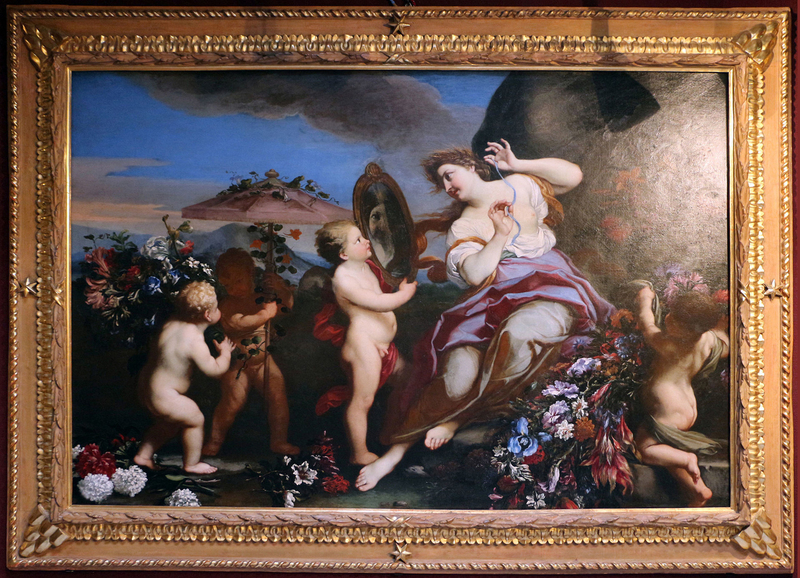 He has kindly supplied the image of another frame in the collection of the palazzo; this is part of the Lemme donation, and forms part of the Baroque museum in the building, rather than one of the original Chigi furnishings. 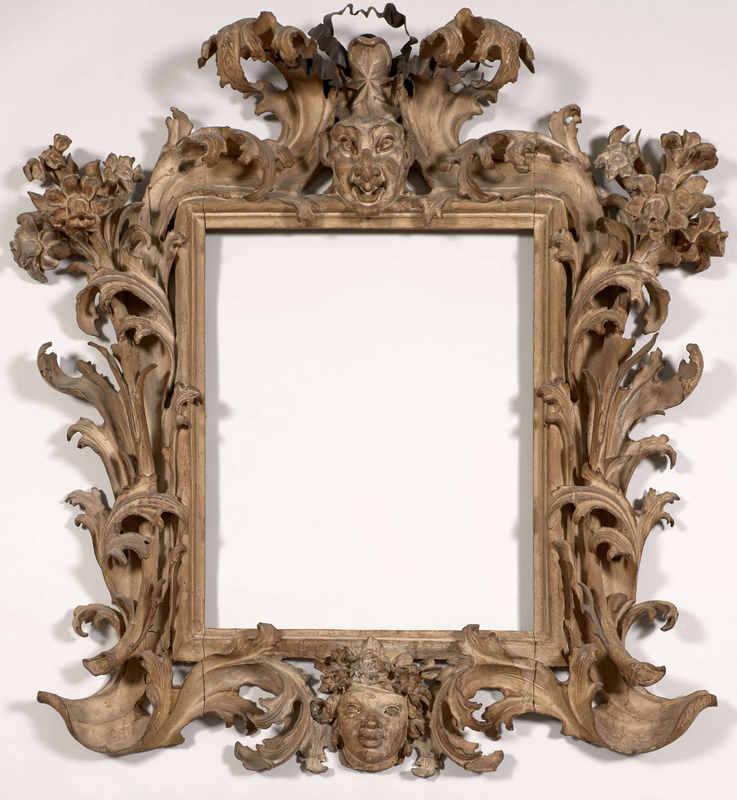 Like the mascaron frame, the frame of the Baldi is composed of two large acanthus branches holding an inner moulding frame, and supporting bunches of flowers at the top corners. 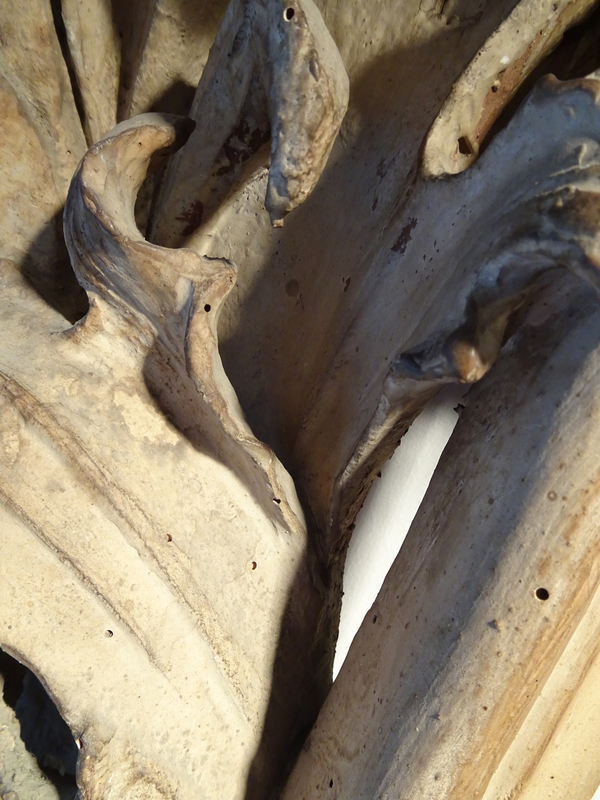 The inner frame has a decorative knulled moulding, and the crest and base of the frame finish in scrolled leaves and tied curling stems respectively. 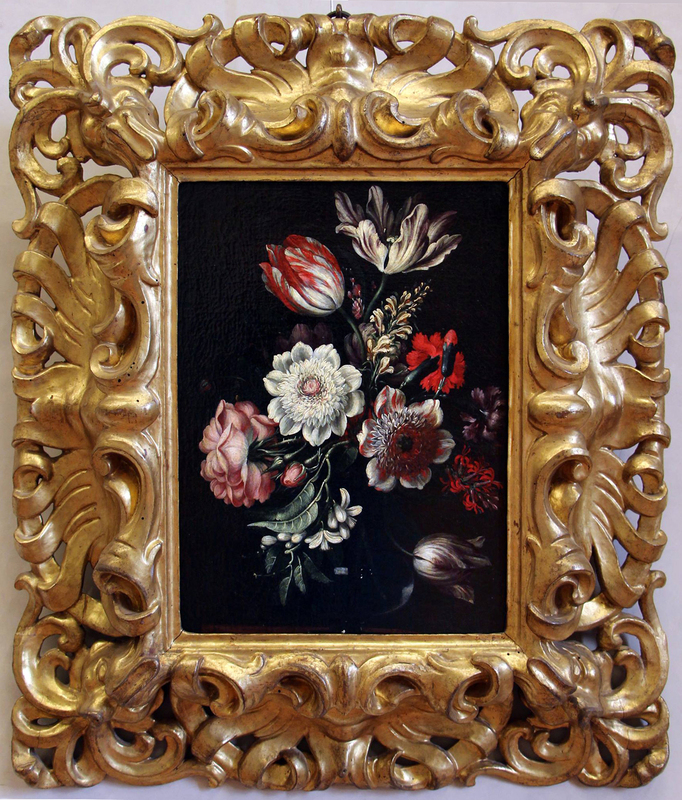 The curling leaves in both frames are very similar (as are the sprays and disposition of the naturalistic flowers), evidently originating in the same structural and ornamental vocabulary which must have been diffused through the circles which surrounded Bernini in varying degrees of proximity. 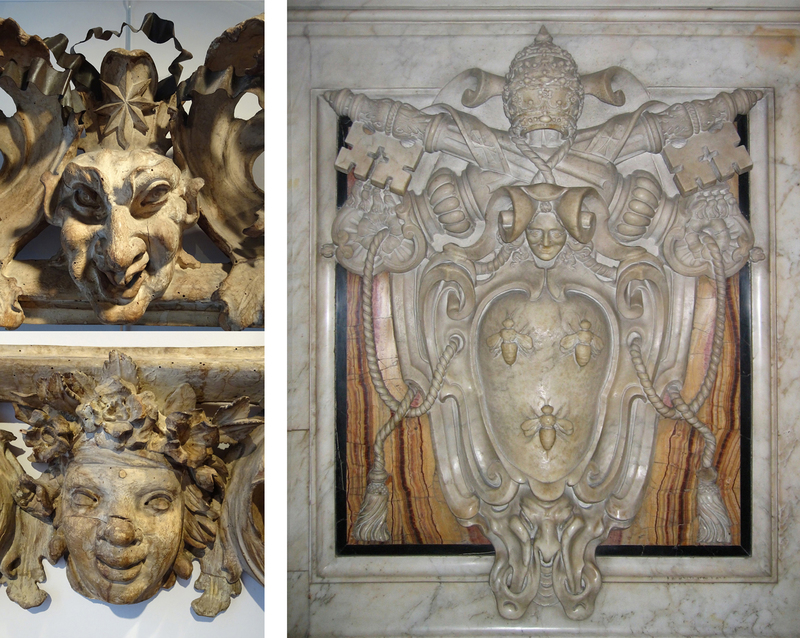 Professor Petrucci noted that ‘even the two masks [on the frame in question] recall those by Bernini’. 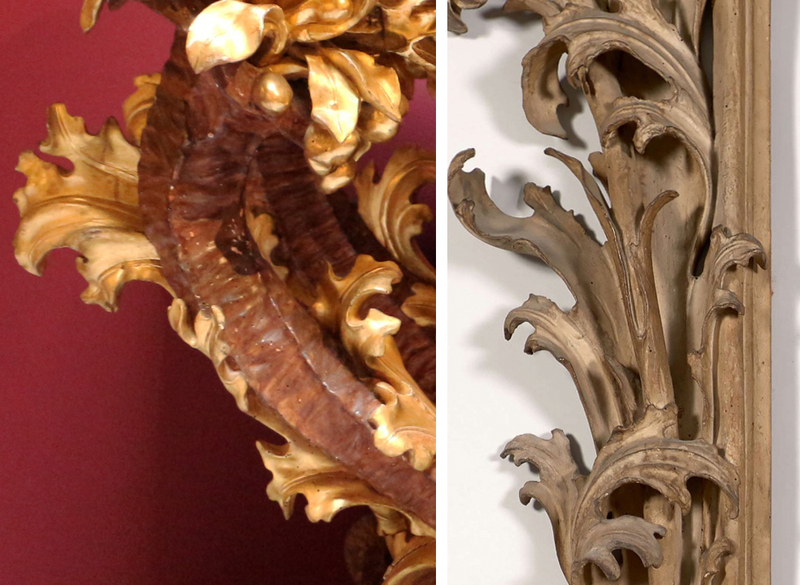 However, the mascaron frame is more freely arranged and fluidly executed than the Baldi frame, the acanthus branches falling into a more natural relationship with the inner moulding they support; and the flowers are more closely tied to botanical realism. The masks themselves are interesting; the mascaron at the top manages to be both a caricature, and – in all its constituent features – physiologically convincing, indicating (as with the bunches of daffodils and narcissi) that it was made by a master sculptor. It is also differentiated in style from the mask at the base, which is completely naturalistic and human with no element of caricature. In this the two faces follow those on the plinths of Bernini’s baldacchino in St Peter’s basilica. On each of the eight outer façades of the supporting plinths, the sculpted marble arms of Pope Urban VIII include a large Mannerist cartouche with the Barberini bees, with a naturalistic face at the top, and a grotesque mascaron at the bottom. The baldacchino was executed between 1623-34, the thirty-forty year gap between marble colossus and wooden frame explaining the movement from Mannerism to Baroque; otherwise the use of contrasting types – human and fantastic – is very close, and may perhaps suggest the use of drawings or models by Bernini. The human faces at the top of the Barberini cartouches are supposed to represent the eight phases of childbirth, ending with a baby’s face, whilst the Mannerist mascarons are decorative grotesquerie, and are practically identical. This may have a bearing on the mascaron frame, since it is hard to believe that this is a unique sculpture. Like Antonio Chicari’s console tables in the Palazzo Chigi, it was almost certainly originally one of a pair; it might even have been one of a suite of four. 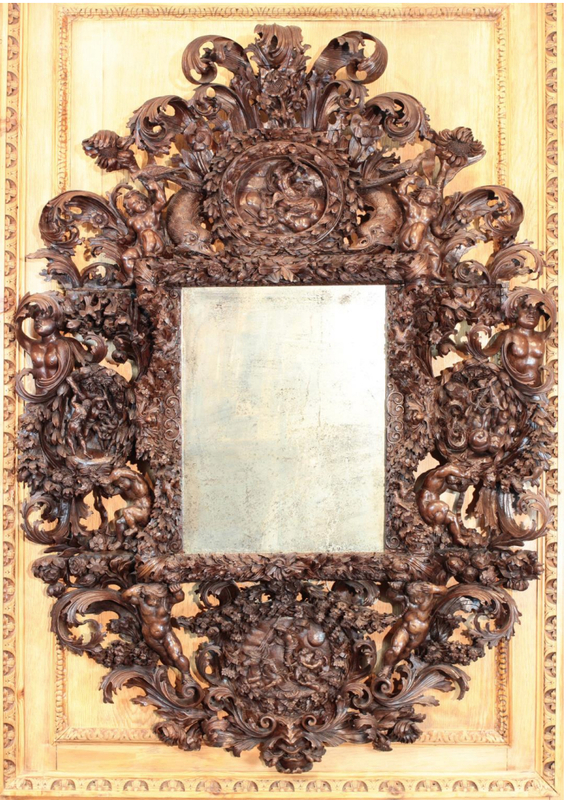 In order to explore what this might mean in relation to the carved masks, it is necessary consider various possibilities regarding the location and function of the frame(s) in a Baroque palace or villa; and here the finish is important. 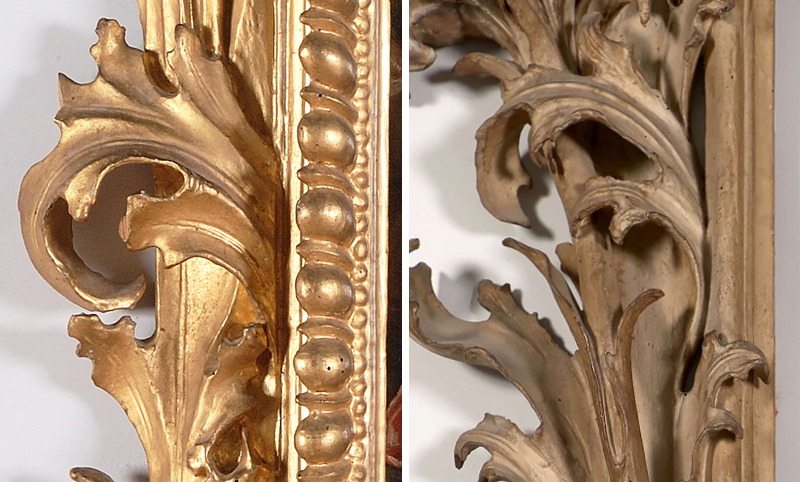 Unlike the other examples of Chicari’s work mentioned above, and unlike the frame on the Baldi Ecstasy of Santa Rosa, the mascaron frame is not gilded, but finished with a wash of stone or off-white paint which remains in remarkably good condition, especially where protected by the undercutting of the leaves. This sort of finish, imitating a plain pale stone, would not have fitted into the decoration of the state apartments in a Baroque palazzo, where the materials used were richly-coloured pietre dure, gold, precious woods, silks and velvets, or painted faux marbre. A plain stone finish on a piece of furniture or a frame suggests a location closer to the outside world: probably in a room which gives onto a garden, and which might accommodate a summer dining-room or reception room. 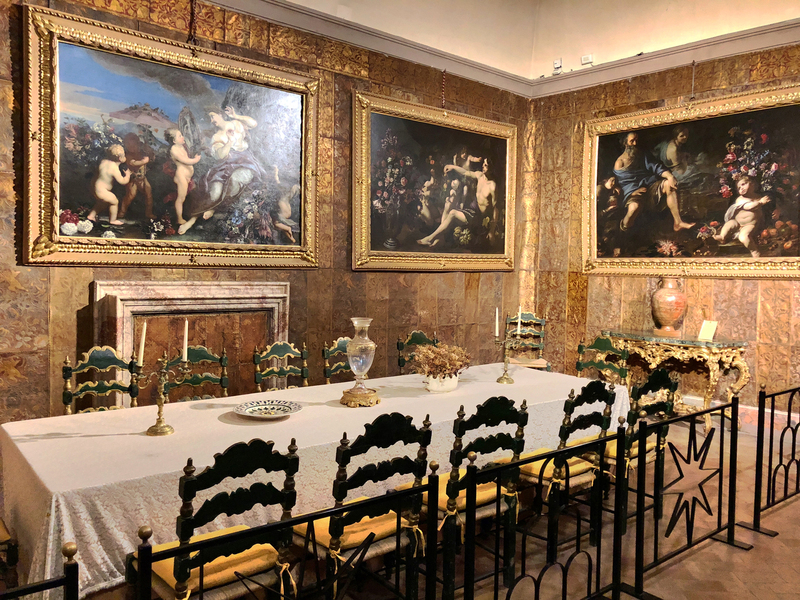 In this sort of space a collector might hang paintings of the hunt, pastoral mythological scenes, flowerpieces, game pieces, pictures of food, series of the seasons or the elements – or, of course, a series of looking-glasses to reflect the light and views of the garden. 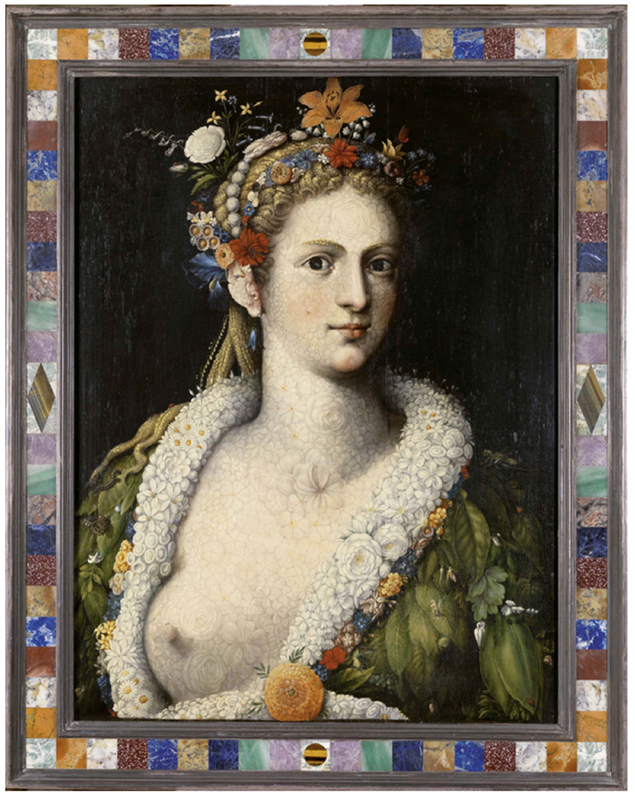 The Palazzo Chigi has examples of some series of paintings; for instance a group of the seasons, by Mario Nuzzi and other artists, which – although not in faux stone frames nor hung in a summer dining-room – do approximate a similar tone in their parcel-gilt wooden mouldings and the gold background against which they hang. 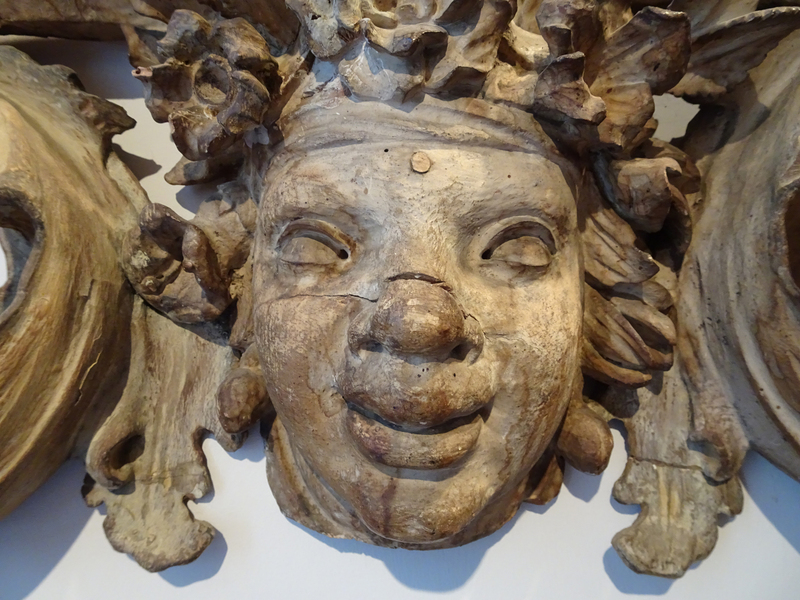 The mascaron frame could be part of such a series; perhaps Spring or Summer might once have smiled from it, reflected in the flower-crowned mask at the base. It would have been a simpler portrayal than in Nuzzi’s scenes, peopled as they are with several figures, set in landscapes and elaborated with still life arrangements of fruit and flowers; perhaps a single figure, like Arcimboldo’s Flora meretrix…? It might equally have held a flowerpiece, also perhaps representing the seasons – these were a popular Baroque decoration; see, for example, the paintings by Bartolomeo Liggozzi in the Villa Poggio a Caiano, near Florence. These, being painted in Florence, are framed in the ‘Medici’ style of the period, rather than in a Baroque Roman leaf frame. The villa where they hang was begun in the late 15th century by Giuliano da Sangallo for Lorenzo de’ Medici, and is, coincidentally, an apposite example of the country house opening to the outside, natural world, where a cool garden room, or room opening on a loggia, might hold furniture and frames with a similarly cool ‘garden’ cast. The most convincing argument for the use of the mascaron frame in this situation, however, is for a looking-glass; again, probably as one of a pair, or a group of four. Of the two looking-glasses illustrated above, the first leaf frame may well be a single, non-series example, as it has no ornament, trophy or attribute which reaches out beyond itself to form a link within a group. The second walnut frame is also complete unto itself, since it carries all four scenes depicting the elements. However, the mascaron frame, with its one grotesque and one realistic head, seems to point to further variations on these. 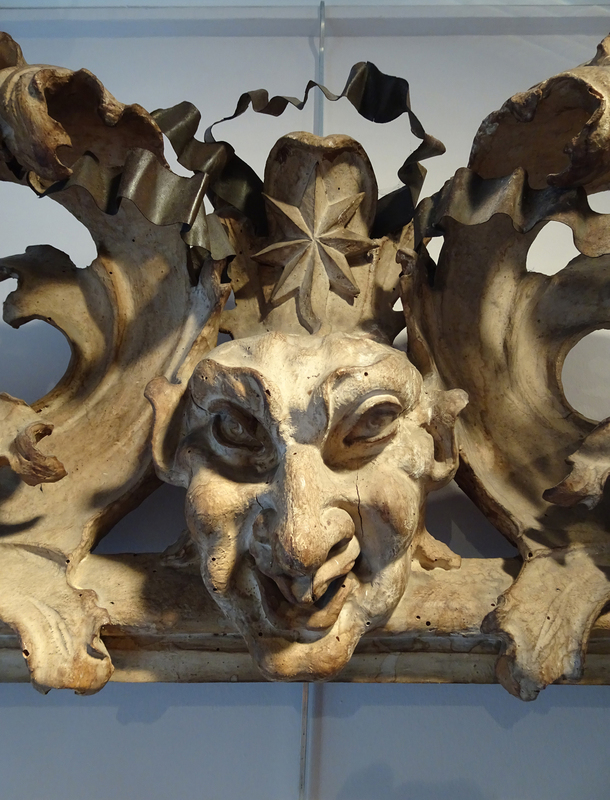 The mascaron at the top of the frame is one of these grotesques, designed originally to ward off evil spirits or (in the form of the Green Man) to placate the pagan presences in nature, and latterly often changed to a satirical spirit of laughter and mockery. The individualized head at the base is, as suggested, the personification of a continent (possibly Africa), an element (earth), or a season (Spring or Summer). A relevant example in the case of the continents would be Bernini’s Fontana dei Quattro Fiumi in the Piazza Navona, Rome, where the gods of the appropriate rivers represent their land masses. 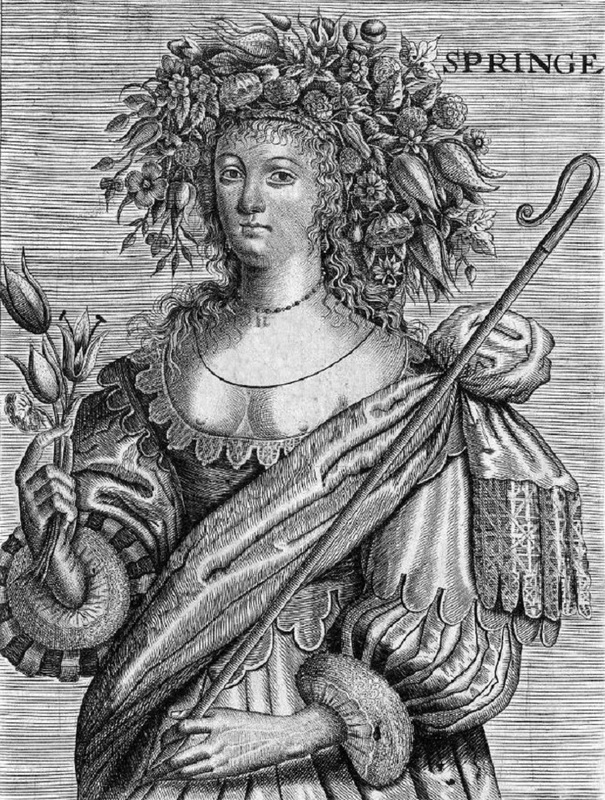 Personifications like these were frequently disseminated by engravings, often from the Netherlands or the north, such as in this early 17th century English engraving of Spring. The possibility that the mask on the frame does represent Spring is supported by the bunches of daffodils and narcissi carved at the top, and makes it less likely that two seasons (Summer and Spring together) are intended. Summer was generally depicted with sheaves of wheat, Autumn with grapevines, and Winter with fire. 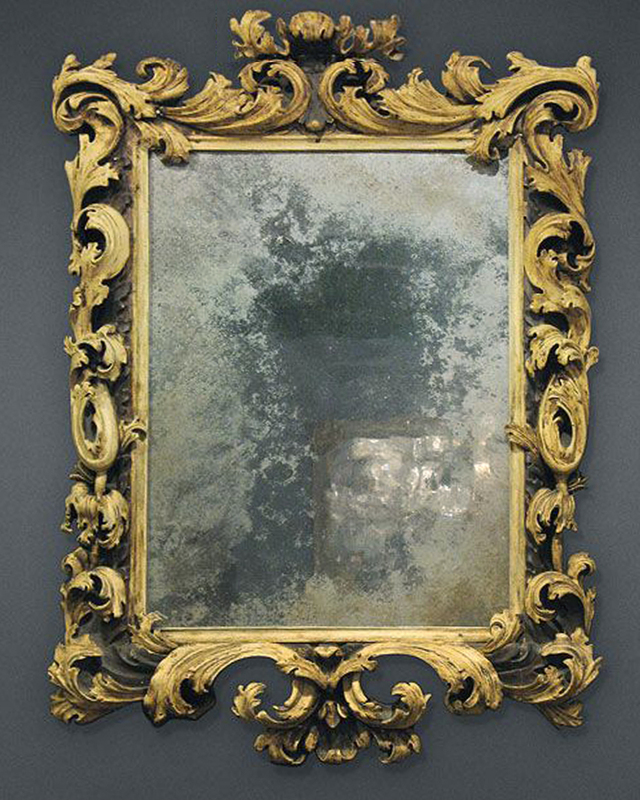 In conclusion, perhaps the most likely history for this frame is that it is one of a series of two or four, probably depicting the seasons, and probably made for a suite of looking-glasses to decorate the garden room in a villa or palazzo in the vicinity of Rome. It may well have been executed by Antonio Chicari or his workshop, and probably owes its design, either directly or at a short remove, to Gian Lorenzo Bernini. It was almost certainly also made for a member of the Chigi or Altieri families in the late 1660s or the 1670s.